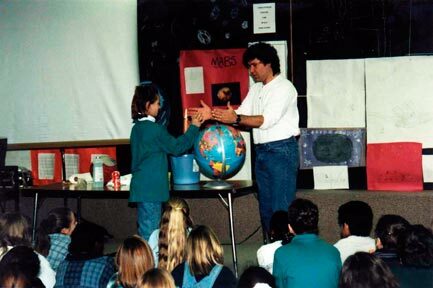 Astrophysicist Dr. Jeff Goldstein, visits with an elementary school class in Broken Arrow, Oklahoma, 1997, as part of the Journey through the Universe national pilot program. His presentation How Big is Big? provides the students a context for his studies of weather on other planets using telescopes here on the surface of Earth—tens of millions of miles away from the planets he’s exploring. But how do you get kids (and adults) to understand the seemingly incomprehensible distances involved when studying the Universe? Even the Moon, our closest celestial neighbor, is 240,000 miles away—which is just a big and rather meaningless number, and only good for memorizing and parroting back on a test. That’s not what learning is about. But models offer a great solution. They allow us to gain a deep sense of the majesty of the Universe, and provide an emotional context for understanding. In the picture, Dr. Jeff has just finished exploring with the class whether the globe is a model of Earth. Here he’s showing a student that almost anything can be used as a ruler, even the model Earth, and has her adjust the distance between her hands so that it reflects the diameter of the globe. He then let the class know that the model Moon—about the size of a baseball relative to this globe—would need to be placed 30 Earth-diameters away from Earth. The student is about to use the distance between her hands to walk 30-Earth diameters away from the Earth globe and place the model Moon. The class (as always) is just amazed at how far away the Moon really is based on this model of the Earth-Moon system—and that we actually sent people to walk on the lunar surface!